Guess where Melbourne's fastest growing region is - it's almost certainly not where you think! Guess where Melbourne’s fastest growing region is – it’s almost certainly not where you think! If you’ve been following my blogs you’ll know I watch demographic trends carefully as I believe our long term demographic trends will shape the future of our property markets more than the short term influences of interest rates or consumer confidence. So it didn’t surprise me when The Age reported that people are piling in to Melbourne’s central business district at a record rate. 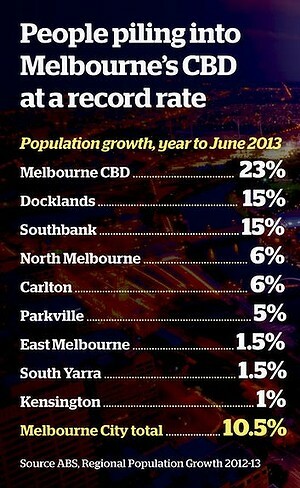 And Docklands and Southbank were not far behind, each with growth rates of 15%. Despite this huge surge in population, these are not locations in which I would invest because the huge oversupply of properties int he region have meant there has been little capital growth ( an in many cases no capital growth) when apartments are sold even up to 10 years after completion. Although extreme, the packing of Melbourne’s CBD is part of an Australia-wide trend. Capital cities packed in more than three times as many new residents as the rest of Australia in the year to June. The Bureau of Statistics says by the middle of the century the proportion of Australians living in capital cities will have climbed from 66 to 72 per cent. The population of Melbourne’s CBD has doubled in the past nine years, climbing from 12,700 to 29,300. Around 5400 of those new residents arrived in the past year. The wider Melbourne City region has gained 45,000 residents in the past nine years; 11,000 in the past year. The population of the nearby inner-city Abbotsford climbed 20 per cent in the past year. The tide moving toward the inner city has seen the population of some middle and outer-ring suburbs shrink. In the past year Mill Park has lost 380 people, Endeavour Hills 210 people, and Frankston North and Rowville 160 each. Greater Melbourne’s gain of 95,500 is the largest of any capital city. Geelong had the largest growth of Victoria’s regional cities, up by 4800 people, followed by Ballarat (2100), Bendigo (2000) and Latrobe in Gippsland (1600). The Bureau of Statistics says Melbourne has been growing faster than Sydney since the turn of the century. If present trends continue it will overtake Sydney to become Australia’s biggest capital city with a population of 8 million in 2053.